At Headline Shirts, we're obsessed with making intelligently funny tees and apparel. While that makes us lousy dinner guests, it makes us really good at making smart, great-looking stuff that you won't find anywhere else. We're pretty sure you're going to like what you get from us. But if you don't, let us have it. We want to do whatever it takes to fix it (unless that involves being the getaway driver in a heist or something). Katie at Headline Shirts gave me a wonderful opportunity to do a review/giveaway! 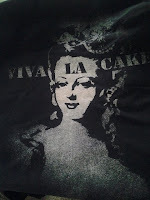 (Read Below Review To Enter) I chose the Viva La Cake! Shirt, for many reasons. For one, The Viva La Cake ($24.00) about made me pee my pants. For one simple reason. I'm a huge sweets lover. And the second reason I love this shirt is because I love the faded Marie Antoinette print. It spoke to me, telling me to buy her, and well no one can resist Marie Antoinette. Duh. We know she's got a shaky reputation, but Marie Antoinette had a point with the whole "Let them eat cake" idea. I mean, if someone was like, "You have a choice of this piece of bread or this piece of double-layer pumpkin cheesecake," what peasant in their right mind would choose bread? Now, obviously we're not saying that one could live on double-layer pumpkin cheesecake. You would need to balance it out. Maybe mix in some German chocolate cake, along with some caramel cream gateau, and possibly a lemon bundt with rasberry rhubarb glaze. But you get the idea. In conclusion, don't viva la revolucion. 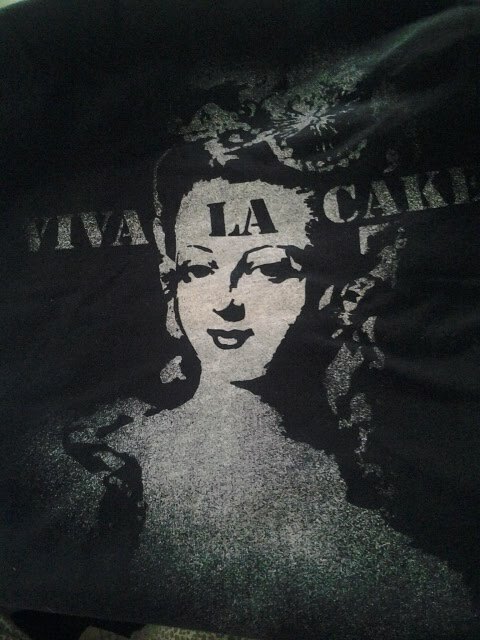 Viva la cake! A couple of my favorite Shirts from Headline Shirts are of the following - chinese food and donuts , french bulldog , and squirrels squirrels squirrels . I have a bunch more, but it would take forever for me to name them all. This is one of my most comfortable shirt I currently own. I would go in a coma in this shirt while I'm sick if I didn't think I would mess it up. I can throw on a pair of blue jeans, this shirt, and a pair of flip-flops and everything is alright. People probably think I finally found some style wearing this shirt. (I will keep letting them think that.) Sizes come in S-2xl (3xl currently out of stock) in mens. • VintageBlend™ tee by Headline Shirts, • Made in San Francisco, • 60/40 xtra-soft cotton/poly, • Eco-Friendly Discharge Ink, • Ships in 48 hours. and S in womens. S-XL is currently out of stock. You can request the sizes that are out. And trust me. You will want too.. •VintageBlend™ Scoopneck tee by Headline Shirts, • Made in San Francisco, • 60/40 xtra-soft cotton/poly, • Eco-Friendly Discharge Ink, • Ships in 48 hours. Headline Shirts Has an amazing selection of Intelligen​tly Funny Shirts for Men, Women, Kids, and even Acessories. You can get $5.00 Off your order if you sign-up for the newsletter if you use This Link. FOR THE GIVEAWAY.. I'm going to make it short and simple..
(1) Winner of my blog will score a (FREE) Headline Shirts of THEIR choice. FREE SHIPPING also! (1) You (MUST) be a follower of (THIS) blog, GFC connect (Google Friend Connect) or LinkyFollow. (Comment that You Are or That You Did. ... That's it! .. Comment below that you did the above. ♥ You can find Headline Shirts on Facebook - Here. ♥ You can find Headline Shirts on Twitter - Here.